On March 19th, UVLT held our 21st Annual Conservation Commission Gathering at Hypertherm. 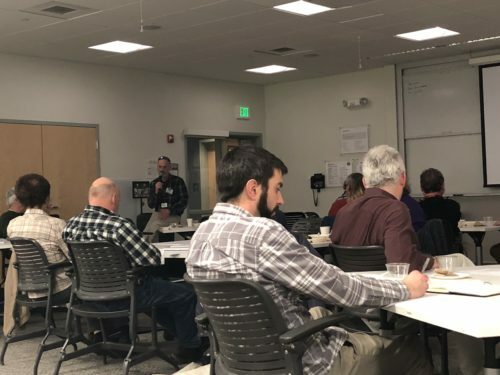 Participants came from 15 towns and 5 organizations across both states to spend the evening having dinner, chatting with their fellow commissioners, and learning about Planning for Climate Change Resiliency. 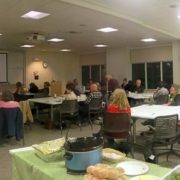 The speaker for the evening was Sherry Godlewski from the New Hampshire Department of Environmental Services and the Upper Valley Adaptation Workgroup. Her presentation was titled “Natural Resources, Local Economies, Climate Change: Exploring the Links and Opportunities for Action” and focused on ways that Conservation Commissioners can be involved in climate resiliency planning in their towns. Her power point slides can be found here. In addition to Sherry, four other organizations were present to speak to specific instances of climate resiliency in Upper Valley towns. Megan Butts represented the Upper Valley Lake Sunapee Regional Planning Commission, Kevin Geiger represented Two Rivers Ottauquechee Regional Commission, Mark Goodwin spoke as a City Planner for the City of Lebanon, and Paige Haverly spoke as a citizen member and chair of Hartford’s Community Resilience Organization. Andy Boyce, UVLT’s Conservation Mapping and Field Specialist, briefly presented on UVLT’s work toward planning for climate change resiliency. UVLT is increasingly examining our stewardship methods and conservation projects with an eye toward a changing climate and advocating for conservation as an important tool in planning for climate change resiliency. 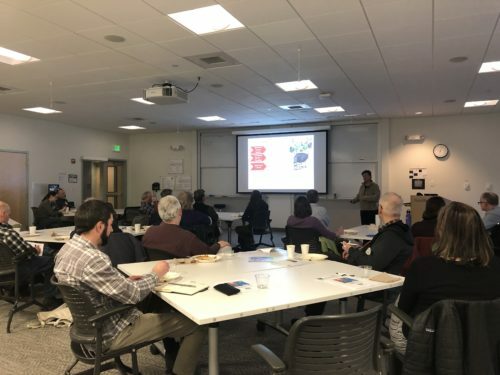 UVLT is currently exploring opportunities that would provide resources and support from organizations like the Land Trust Alliance and the Open Space Institute that offer programs and resources specifically designed to help land trusts address climate change. UVLT continues its support of town level, local conservation efforts and seeks to work with towns in their resiliency planning to provide useful information, ideas, and tools as they relate to climate change. 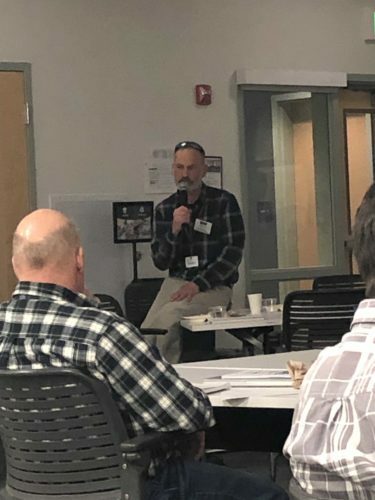 UVLT distributed a survey for commissioners about their interests and objectives regarding climate change resiliency activities in their towns. If you are a commissioner who did not get a chance to fill out the survey, you can still fill it out here. A compilation of Conservation Commission reports can be found here. Thank you to Adimab for underwriting this event and Hypertherm for donating the use of your space. Silent Auction a Success! Rocky Hill Farm Meadows – Conserved!